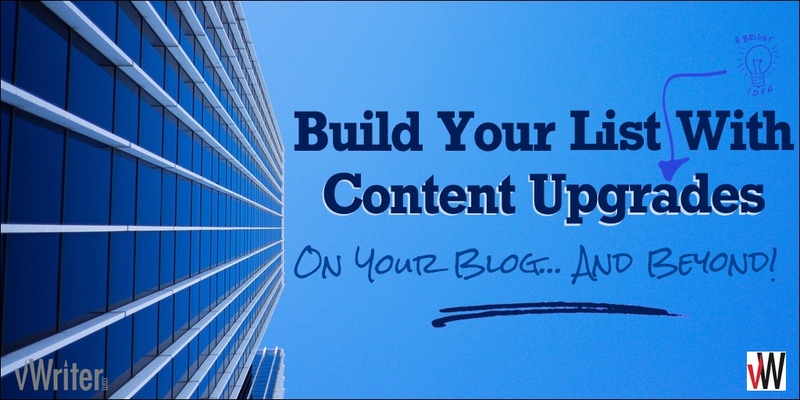 Build Your List With Content Upgrades: On Your Blog… And Beyond! Want a more powerful way to convert visitors to your blog into leads for your business? How about a 300% to 785% improvement in conversion rates? In brief, it means offering more value to the visitor – say in the form of a relevant download – in exchange for their email address. Content upgrades also work when integrated into content published on other platforms across the web. I’ll share more on this below! Get this cheatsheet with 21 ideas for content upgrades. The mechanics: How to actually implement them on your blog – and on other content around the web – including how to deliver the content upgrades to new opt-ins. I’ll cover some easy ways to get you started… and, for the more advanced, not so easy (but more powerful!). The download offered above is an example of a content upgrade I’m using in this post. Think of a content upgrade as a lead magnet that is specific and highly relevant to a particular piece of content. The high relevancy means your opt-in conversion rate is likely to be far higher than for the more generic lead magnet. Let’s say you’re in the weight loss niche. You’ve got a piece of content about how to lose weight by going on a juicing fast. It presents some really useful information with three delicious juicing recipes people can use. Therefore, those visitors are going to be far more interested in a download that offers them a full week’s worth of juicing recipes in printable form – an upgrade on the content they’re looking at – than a more generic offer of say a free ebook on weight loss. Sure, it means a bit more work creating them. But not much, once you’re used to doing them. #ContentUpgrades aren’t just for your blog. For content on their blog. On the basis of one content upgrade per blog post. But there’s more to it than that. I’ve been testing the following couple of techniques as well. So far they are proving very effective. (Related resource: see 9 other ways to convert traffic into leads). There’s no law saying you can only offer a single content upgrade for each piece of content. I’ve found it effective to offer multiple content upgrades. That doesn’t mean I need to create more than one content upgrade each time I write a new post. Instead, it means reusing content upgrades I’ve created before where relevant and appropriate. I’ll just offer a particular content upgrade to the reader, if it’s relevant to what I’m talking about at a particular point and would add value for them. I mentioned a key change in online marketing, mainly relating to the rise of the Millennial generation. The post wasn’t about that particular topic, but I offered a content upgrade that helped explain the rise of the Millennials for readers who wanted more information about how it affected them. I offered a single page downloadable PDF that summarized the 15 tips I shared about publishing on Medium as a business. Similarly, if I talk about keyword research in a post (which comes up quite a bit as you can imagine), I’ll mention our essential Keyword Research Guide that the reader can download. It’s a great way to offer additional value to the reader, while helping to build my list. Just as I might link through to a particular content upgrade within a blog post, I can do the same when I repurpose the content and publish it elsewhere. I’ve not seen anyone else really doing this, but if anything it can be more effective. That’s because when you publish your repurposed content on platforms like LinkedIn Pulse or Medium, you tend to get higher engagement levels and your content reaches more people. As an example, here’s a post on LinkedIn Pulse I published a few days ago, repurposed from a recent blog post. The original blog post received a couple of comments and was shared a small handful of times. While these engagement metrics will increase in time as the blog grows*, its main current value is as a long-term content asset for the business, attracting traffic from search. *For example, social referrals for the past three months have increased 45% on the previous three month period. Comments on the blog for the past six months have more than doubled on the previous six months. In clear contrast, within just 24 hours, the repurposed content on Pulse had been shared dozens of times, attracted several comments, and had been viewed hundreds of times. By repurposing content, you can reach much wider audiences than solely publishing on your own blog. Using content upgrades within this content too helps further build your list. By including a content upgrade within the LinkedIn Pulse post itself, I received a surge of new leads for my list. For added benefit, I also linked back to posts on my blog that included content upgrades themselves. The content was also published on other sites too, again incorporating content upgrades in some way, and leading to more leads coming through. The following shows a SlideShare, repurposed from a post on creating effective blog titles. See how the presentation incorporates a couple of different content upgrades, as well as a more general lead magnet at the very end. That’s three different opportunities throughout the presentation for the viewer to opt-in to my list. Yes, of course, this one’s obvious! List building is likely to be the primary way you build and grow long-term profits from your blogging and related content marketing activities. (For more info on blogging profitably, see my related post on how to blog for money). However, content upgrades aren’t just about list building. Yes. Offering content upgrades on your page can help those pages to gain higher rankings. Content upgrades mean you are providing more value and interest to the visitor. The overall effect is that a higher proportion of visitors will stay on your page for longer. If a proportion are spending time opting in, that much is obvious. Fewer therefore return straight back to the SERPs. This is one of the key metrics used to judge the value of your page to the visitor, and the relevancy of your content to their search query. While content upgrades are traditionally seen as a way to get new leads onto your list, they are also a useful way to build your relationship with existing leads. It’s another marketing touchpoint between you and the prospect. It helps to build trust, and build your own authority and credibility. What’s more, the prospect remains in control. It’s not about you chasing them for the sale. It’s about you attracting them back with your content, and engaging further with them. Because I always share new content on this blog with subscribers on my list, I’ve found that around 60% of people taking advantage of content upgrades are existing subscribers. That leaves the other 40% who are brand new leads. All such engagements add value to the business. 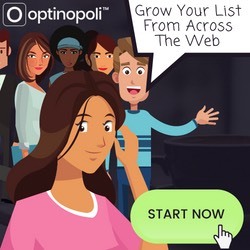 Based on my own results so far after a few months of testing – and based on current traffic levels alone – content upgrades look set to be responsible for the addition of hundreds of new leads to my list this year. That’s leads coming from content upgrades both on the blog itself, and incorporated into repurposed content. But it’s likely to actually be much higher. My initial results come from only just over a dozen content upgrades so far. Traffic to the blog will continue to grow. In fact, based on forecast traffic levels, my traffic goals, and increased levels of content repurposing, in a year or two it’s likely content upgrades will be delivering hundreds of new leads to my list every month. I’m continuing to add content upgrades to older posts. Each one might mean only a handful of new leads a month at present, but they add up over time. I’m adding content upgrades to most new posts as they’re created. With a weekly publishing schedule, that’s another 40 to 50 content upgrade opportunities over the course of the next twelve months. That’s triple what I have now from new posts alone. So what about actual conversion rates? Let me share some of my own data. Here’s an example. For one of my posts, I’ve seen a 32% conversion rate for the content upgrade. That’s significant. But it’s not the full story. For completely new opt-in subscribers coming through the content upgrade, the conversion rate is 6.5%. Another post converts at 4% at the time of writing, if you include those already on my list. For new subscribers only, it’s 3.4%. As you can see, all posts convert at different levels. Jeff Bullas reported a 344% increase in email conversions when comparing posts with and without content upgrades. 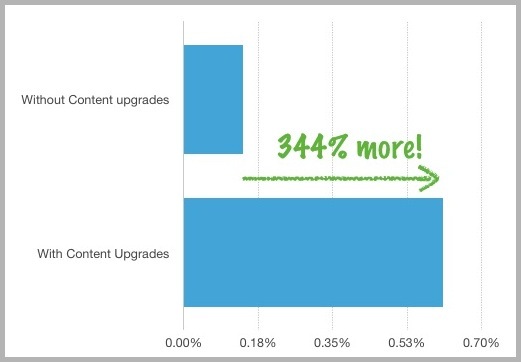 Jeff Bullas found posts using content upgrades achieved a 344% increase in email conversions. Content upgrades turn your readers into subscribers better than any other single tactic out there. I normally experience 20-30% opt-in rates on these bonuses and some have been as high as 62%! Tim Soulo of BloggerJet reported a 300% increase in his email conversion rate, once he started using content upgrades. Even higher, Backlinko’s Brian Dean reported a 785% conversion boost in a single day via content upgrades. Brian Dean achieved a conversion rate increase of 785% after starting to use content upgrades. The worst thing you could do is dismiss them or put them on the back burner. Instead, aim to incorporate content upgrades into your content creation activities as early as possible. Otherwise you’re leaving a ton of leads – and of course potential profits – on the table, untapped. So we know they work. They also require work. No surprise there. I’ve earned my success the hard way—with sweat, tears, and dogged determination…if you’re looking for an elevator to success, you’ll never find one. Instead just put your head down and start climbing. You’ll be surprised at where you end up. But the good news is, by approaching it the right away, it’s not actually that time intensive. Firstly, analyze your stats. Take advantage of low hanging fruit first and create content upgrades that get the most traffic and/or attract the most engagement. As you start seeing results, this creates the motivation and momentum to do more. It’s rewarding seeing those additional leads start to come in! Secondly, if you already have a high number of posts, think about content upgrades you could use across a number of different posts within say a particular category. For example, I’ve already mentioned a Keyword Research Guide I now use in this way. This means you can boost the conversion rate on multiple posts with the minimum amount of effort. The easiest and quickest content upgrades to create are PDF documents (rather than say software or video(s)). So create a document in Word, or within Google Drive, and save as a PDF. The first one will generally take the longest to create. It can then usually act as a template for others. A single page download that summarizes the practical, take-away information shared in your content. A PDF version of the post. A cheat sheet. For example, if you were in the fitness niche, a cheat sheet might provide a 90-day training schedule. Or for the web design niche, it might provide attractive color code combinations. There are plenty more. In fact, here’s a cheatsheet with 21 ideas for content upgrades you can get sent to your email. I can practically guarantee you’ll find several here you won’t have even thought of. Make the content upgrade continue to work for you! In creating the content upgrade, you can ensure it continues to deliver benefits to your site long after someone has actually opted in to obtain it. Include the domain name in the name of the file you are using for the content upgrade. When someone sees the file some weeks or months from now, they’ll remember where it was from and may return to the site. Include your logo in the content upgrade. Again it serves as a reminder of where the person got the resource from and helps attract them back to the site. How to create content upgrades – add your logo and a link back to the post for future traffic. Add a link back to the post in question. This is often useful for the subscriber in case they want to return to the source, while benefiting your business with the repeat visitor. I usually include a short-form version of the actual blog link, using the Pretty Link WordPress plugin. This makes it easier for someone who has printed out the content upgrade, and is typing the link in. This could be some weeks or months down the line. Use the Pretty Link WordPress plugin to create shorter links to the original post. This helps facilitate future traffic from the content upgrade. You may have a specific lead magnet and follow-up sequence that helps sell your product or service. In the initial email they get after they’ve opted in for the content upgrade. You could even include it on the thank you page after they’ve opted in, offering them the chance to opt-in to that as well. LeadPages – a popular option for implementing various opt-in mechanisms, and suitable for use with content upgrades. Monthly fee. Optinmonster – means you can set a popup for a particular WordPress category. So for any post in that category, the visitor would see the popup. This is useful if you have a content upgrade applicable across a number of posts. Monthly fee. Sumome – popular and powerful WordPress plugin that helps convert blog traffic into leads, amongst other features. Get started for free, but you’ll likely want to upgrade at some point which involves a monthly fee. For example, you can set a different Scroll Box on each page pages, offering a different content upgrade. I wanted a bit more than the off-the-shelf options provided, as good as they may be. So I opted for a bespoke solution. To be able to simply add a content upgrade link to both a post and within repurposed content, with nothing further required. In other words, super quick set-up. Have the opt-in squeeze page dynamically created. Once opted in, display the relevant download link immediately for subscribers who were already on my list, or otherwise ask them to confirm (I use double opt-in). Incentivize someone to share a particular post on Twitter by offering all the content upgrades on the blog once they’d signed up for one (more on this below). This has already resulted in several more shares. Provide opportunities for the new subscriber to follow vWriter on different social networks. The solution I now use means that all I need to do, apart from create the content upgrade itself, is to add the details for each content upgrade into a database. The system then takes care of the rest. It means I can for example easily integrate content upgrades into videos, SlideShares and textual content across a number of sites. It’s not particularly complicated, and may cost a developer a few hundred dollars to set up a similar type of system for your own business. With lots of different content upgrades available, you don’t want to have to set up a new autoresponder for each one to provide the download link. That would get fairly ugly, and time consuming to both set up and maintain in future. Instead, the set up for each one needs to be as quick and simple as possible. Have a single page that lists all the content upgrades I have available. Have a single autoresponder that directs new leads to this page. Does that matter? Not really. It’s not perfect, but nor does it have to be. 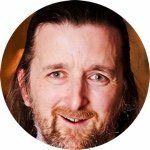 Want to become a content upgrade pro? How about improving your conversion rates 100% to 300% or more? In other words, by tripling your conversion rate, instead of say 10 new leads, you get 30. Or instead of 30, you get 90. Over time, instead of a list of 10,000, you get 30,000. It also triples your sales. And all it involves are tiny changes that can have BIG results. If you don’t believe such improvements are possible, conversion rates for content upgrades vary widely, from say 2% to 20% or higher. All it takes to get from 2% to 20% is a different approach. Simple changes to how you are offering content upgrades can make a dramatic difference to conversion rates. Some tests may decrease response. That’s good, it’s still a result. You’ve learned something. Other tests might only have a negligible or zero effect. No problem. Ignore, and carry on testing. But other tests can make such a dramatic difference, you’ll be glad you tried it. It’s these winners you’re waiting for and that make the testing so worthwhile. Placement on the page. Offering the content upgrade higher up the page will usually outperform an offer that’s further down. Multiple placements. Offer the content upgrade say once at the top, again somewhere in the middle, and towards the bottom. You don’t want to overdo it and detract from the value of the post. But get the balance right, and the more times you make the offer, the more leads you’re likely to attract. A change in wording. Similar to headlines on sales pages, simple changes to how you word something can make a huge difference. If you’re linking to a squeeze page, rather than say triggering a lightbox popup, test different layouts, a different headline, different buttons, and so on. Test lightbox popups in the same way, as permitted by whatever software solution you use. Test out a different content upgrade bonus. One bonus may be far more appealing than another. You don’t know until you try. Try out a different look and feel to the content upgrade offer. For example, a different style of surround and border; or none at all; or simply including the link and offer within a normal paragraph; and so on. Also, as with any split testing, it’s often a combination of different tests that can result in the big improvements. While individual tests might lead to relatively minor improvements, with repeated testing these results start compounding. Test D gives you a 30% improvement. Your conversion rate, once 5%, is now 15%. In other words, when you add up the improvements from the individual tests, you get 10% + 50% + 40% + 30% = 130%. But, thanks to the compounding results of these tests, you’ve leapt from 5% to 15%. That’s a three-fold increase, an overall improvement of 300%. Start testing with post(s) that get the most traffic. With more data, you’ll get insights more quickly that you can then test out and benefit from across other posts. 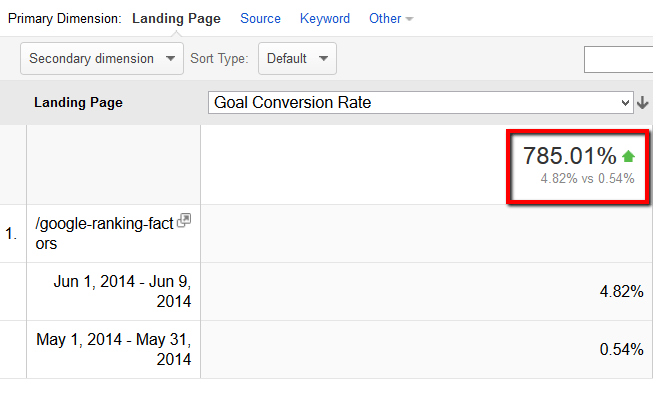 Make sure you have clear conversion rate data for the page in question, so you know what you’re testing against. Test out a change for a number of days until you have data that’s statistically significant. If you have a winner, treat that as your new control. Test something new and try to beat it. If you’re testing out a squeeze page, use a tool like Experiments within Google Analytics to test out a couple versions of the page that run at the same time. Statistical relevance is automatically calculated for you, and you can set it to declare a winner when it’s e.g. 95% certain. 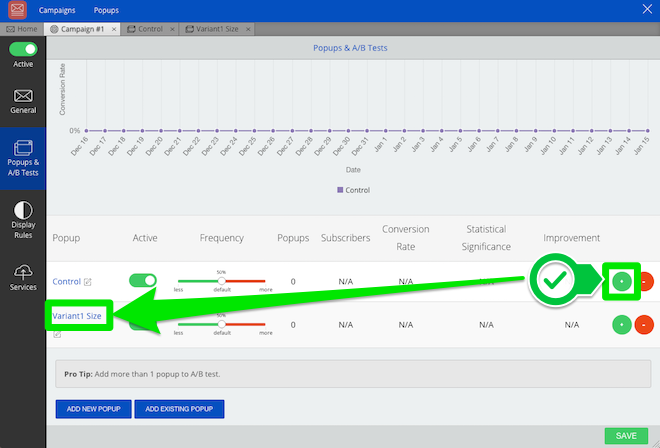 If you’re using the Sumome plugin, the paid version of the tool facilitates A/B testing. Sumome’s paid version permits split testing of your content upgrade offers (image source). This post wouldn’t be complete without my own offer for a content upgrade. So don’t forget, get the cheatsheet with 21 ideas for content upgrades you can start using today.